WordPress might be the best CMS around for newbies and experts to play with different plugins and themes. Updates are released for WordPress at regular intervals to improve security and overall user experience. Sticking with WordPress as a first solution for your new website theme will be very helpful and the themes made for WordPress are top class. Video industry or video portal websites can benefit from these pre made WordPress video themes for displaying video across the websites as a fullscreen video or as a blog easily. This small unique list of WordPress video themes will benefit you for sure. If you are interested in WordPress themes for your other website then you must take a look at our related articles here. When you are planning a website with content sharing at its core, Aruna can be a good theme to serve this purpose. With this theme you have the ability to build some great posts and provide a superb experience to the viewers through its crisp looks. This retina ready theme is fully responsive and it lets you choose from over 600 Google fonts as well. The theme has been created to keep away clutter from content sharing and make it easy and simplistic with an appeal which entices customers to visit your website and enjoy their visit. If you’ve been ideating a website which is one the lines of IMDb where a movie database is created, then Moview can be just the theme for you. 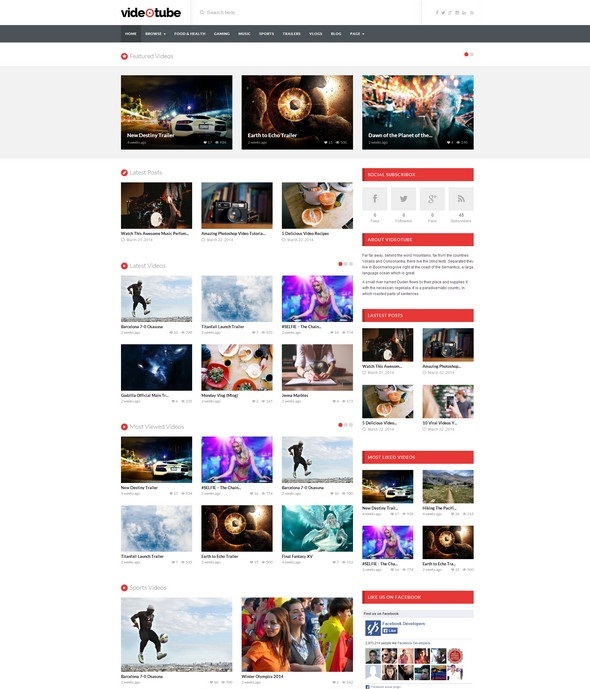 When this theme is packed with some of the suggested extensions, you get a website which not only helps you create a powerful movie database, but it also gives you the chance to add reviews for movies that have been recently released. You can have televsion shows, videogames and even new albums added to your websites giving users the opportunity to make the most out of your website’s database. This easy to install theme is popular for its database creation abilities. 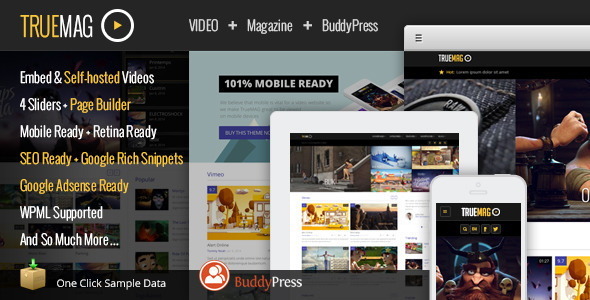 This fully responsive website is great for those who need a blog or a website for videos. It also serves the purpose of a magazine blog very well. It offers great flexibility in its layouts and you will have numerous theme options to choose from. The theme is created very well in order to get the attention of the viewers and augment the number of visitors to your website. 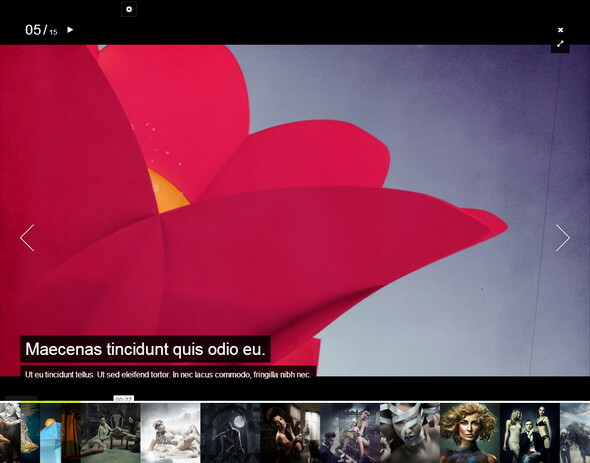 It is a great solution for users who are looking for a content focused theme. 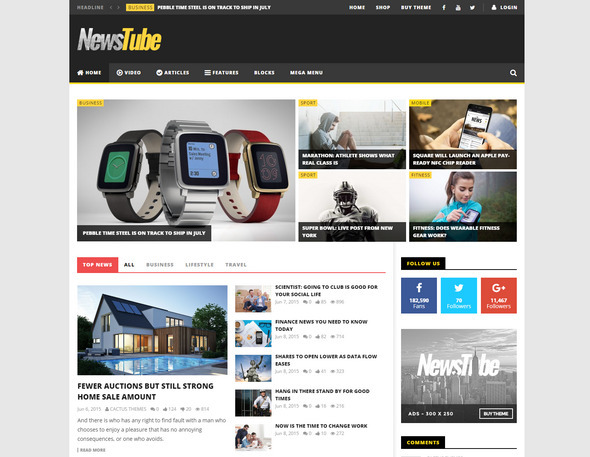 NewsTube is loaded with video features that can help you create a great video oriented site. 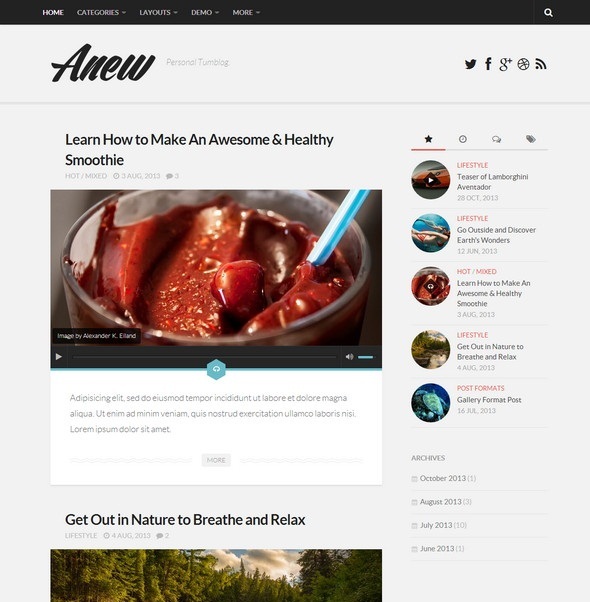 Anew is yet another fully responsive theme which comes with 100% high resolution and gives you the choice of 10 unique post formats. There are some great styling options to choose from to give your website or blog a personal touch. With unlimited widget areas you can explore your creativity and make the most out of the theme’s real estate. It gives you the chance to showcase videos effectively and to ensure that your visitors enjoy their visit to the blog. Anew has features which can be highly accounted for and users can have fun with the many options they have to explore the possibilities of this theme. One thing that makes this theme popular is the live support you get for the theme. 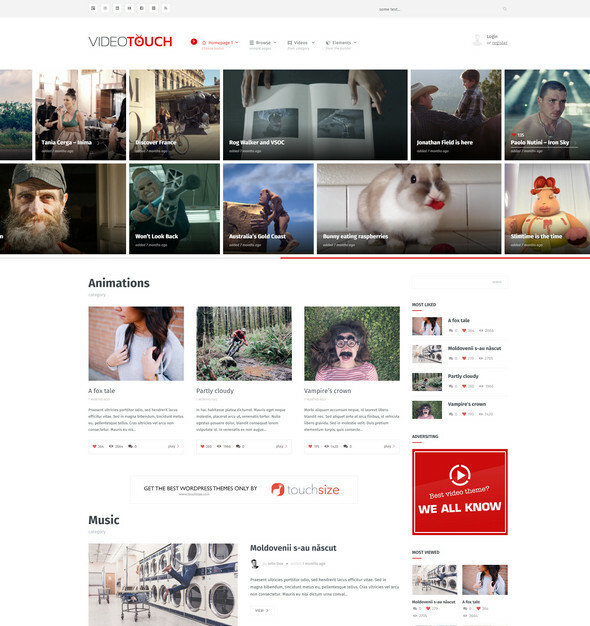 This means that if you are new to themes, you will not feel too lost when dealing with VideoTouch. With its front-end submission feature, adding videos to the website or blog becomes a whole lot easier than you could imagine and the good thing is that you are not limited to the sources from which you can upload or embed the videos. There are a lot of layouts to explore and many colors and fonts to choose from. 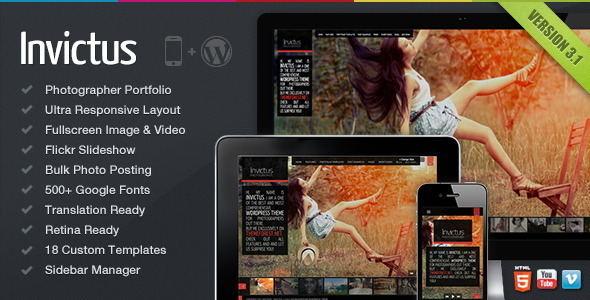 This user friendly and fully responsive theme has a lot of potential for its users. Why tangle yourself up in difficult codes when you have the opportunity to use drag and drop layouts now? Snaptube offers a user friendly approach when using themes by eliminating the need for codes and using drag and drop layouts. The entire theme can be set up quickly because of the effortless way in which it works. There are some free plugins which can help enhance the working of your blog and with over 100 Google fonts, you can give your website the look you want. 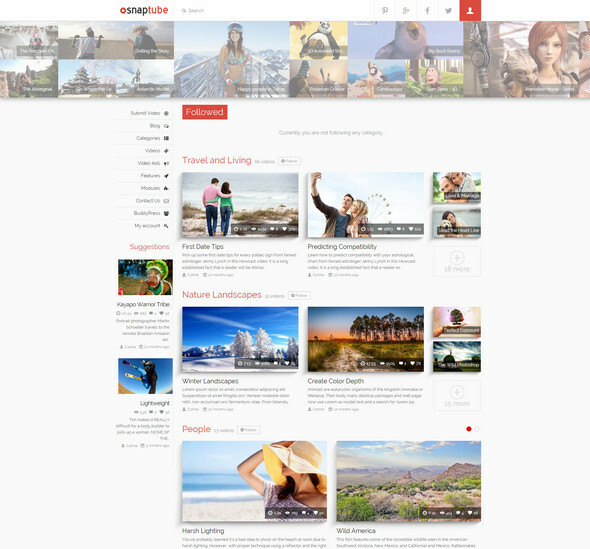 Snaptube is a powerful and flexible theme which offers a fully responsive website. From embedding videos from other websites to uploading your own library of videos, VideoTube is a theme that makes video websites a lot of fun. 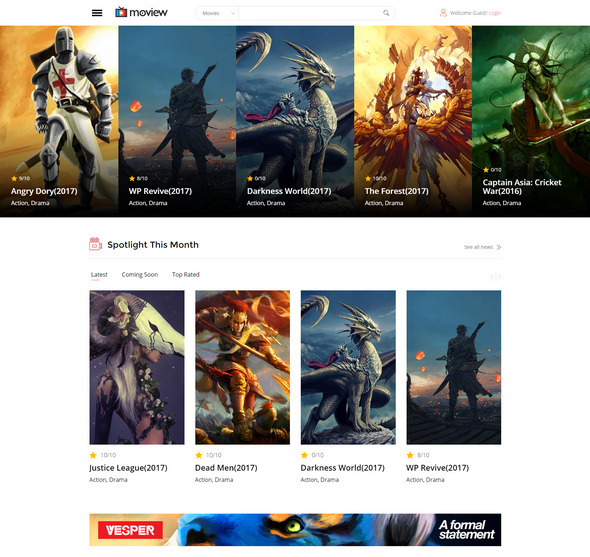 You can have VideoTube automatically insert thumbnails of the videos for you and you can also promote user submissions to the extent where they can also have their own channels. 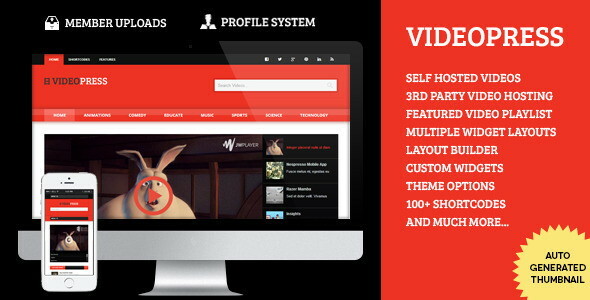 With a responsive design and 2 different video layouts, you would love showcasing videos with the help of VideoTube. It is a fantastic website for those who are looking for some good theme to display a collection of videos whether it is owned or embedded. Designed specifically for video sites, this fully responsive theme offers the chance to create video blogs and sites quickly and easily. The inspiration for BeeTube lies in some of the popular video websites like YouTube and Dailymotion. 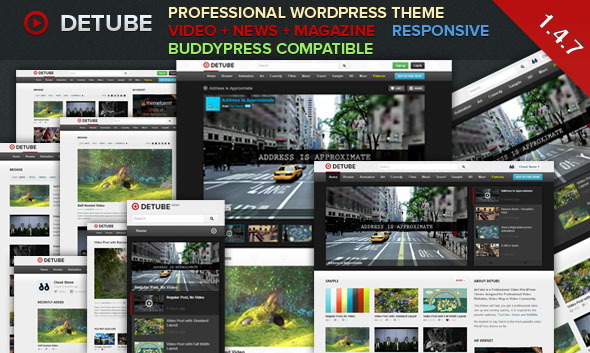 You find yourself getting creative with layouts, fonts and colors as you try to set up a video site with BeeTube. It is one of those WordPress themes that works perfectly when it comes to video oriented websites. It is a fully responsive theme and its popularity lies in the fact that it can be set up effortlessly and it does not take a lot of time to set it up either. With some of the latest transition effects and a powerful set of features, FlowAway is a WordPress theme that has a lot of potential for those who would like to create a video oriented site. It has two different styles known as the light and dark side. Both of these styles are superb and can be utilized by just about anyone because of its user friendly interface. The theme offers a lot of flexibility when it comes to the page width, menu bar, the background as well as the content of the site. With the fully responsive feature of FlowAway you will be able to capture the attention of a large audience who use a variety of devices to check your site. When modern looks meet a clean interface, the results are absolutely wonderful. This is exactly what is rendered to users through True Mag which has been built with simplicity at its core. It is a user friendly theme with a fully responsive design. Hosting videos becomes a more natural and easy task with True Mag. In addition to using it for video content, bloggers who want to create a sophisticated blog or an online magazine will find True Mag to be great as well. As for videos, you can either embed them from other popular sources or you can host them yourself. There are a lot of slider styles to choose from so that your videos are presented in the most appealing way. When you want a professional video website which is fully responsive and retina ready, then deTube can be a great consideration. It is great for posting videos and it can be used effectively as an online magazine or news site too. The different options available to the users that make deTube great are the number of fonts and colors with which you can explore the possibilities of adding a soul to your website. With quite a few layouts and post formats available for you, you will find yourself looking forward to a great experience with deTubel. You will be able to establish better interactions with your visitors. Designed with the latest and the best – HTML5 and CSS3 – This Way is a WordPress theme that is meant to impress your customers. It offers a full screen video and image ability and social media links are no problem with this theme. There are a lot of possibilities that you can explore with This Way. It offers a huge amount of customization and you will have a lot of features which makes this theme good for video content. With over 600 Google web fonts and different layout options, you will be able to give your website the kind of look you have imagined with ease and it does not take very long to set it up either. There a lot of reasons why users prefer Right Now as their theme for their blog and website. It has some great user friendly abilities which make you feel like you are working with something that is way simpler than the complex world of coding. Enhanced with AJAX, Right Now is simple and it is quick to install and set up. From different theme options, a variety of colors to choose from and different skins to enhance the beauty of your website, video content hosting sites enjoy the many features that Right Now has to offer. With its responsive design, full screen background and video capabilities, Black Label is a theme that is loved by users because of its unlimited possibilities. It is translation ready so that you can meet the needs of a diverse audience and with its unlimited portfolios and galleries, there is a lot to experiment on Black Label. It comes with WoCommerce if you plan to open an online store and a latest addition to all its features is a splendid new white skin which is being referred to as the White Label. This user friendly theme is quick to set up and easy to use. 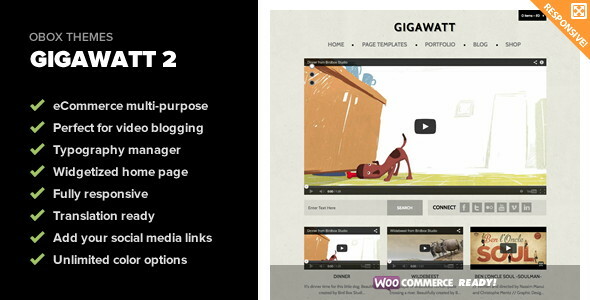 Gigawatt’s popularity lies in the massive amount of features and the huge flexibility it offers giving each website a unique look. With 8 different page templates and tons of customization options, users get the chance to get creative with Gigawatt styling the pages in the manner they want. You have widgets and a variety of color options along with a slider that makes this responsive theme user friendly. It is also ecommerce ready if you plan to open an online store. With built in SEO, you wouldn’t even have to worry about optimizing it for the search engines. 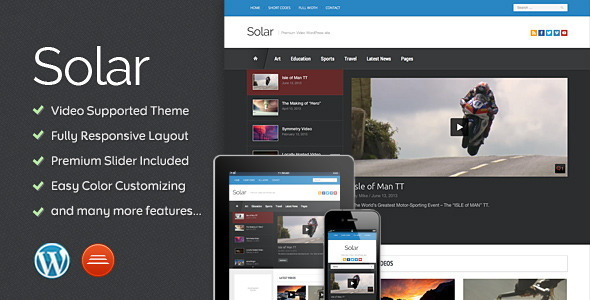 This theme is built for those who are inclined towards creating a film-focused website. Studios and production artists would enjoy using The Producer. It has a unique panel effect for scrolling which gives your visitors a great web experience. For those who prefer the usual credit card roll, The Producer has that too. With lot of possibilities and some great customization options, this WordPress theme is splendid and it does not require a lot of knowledge on coding either making it user friendly and easy to use as well. This outstanding theme can be a lot of fun for creative brains trying to put together a website. There are a lot of things that users like about ColdFusion. This WordPress theme which is meant primarily for photography and videos can be a great option considering the huge number of features it has. The responsive design and different layout options gives users the chance to play with the looks of the website to achieve something that will be liked by the visitors. Talk about Google fonts and the theme has a lot to offer in it as well. It supports videos embedded from all the major video websites like YouTube and Vimeo. A highly scalable theme that presents photos in a perfect way, Invictus is one of those themes that you would simply love to customize and create a website for yourself. It is an SE optimized theme and it does extremely well when it comes to performance. Its versatility is enjoyed in the extensive customization options it has for its users. With lots of theme options and even support for embedding videos or uploading self-hosted videos, Invictus is great for video content and photography. Do you want a theme that adds great features to a superb design? 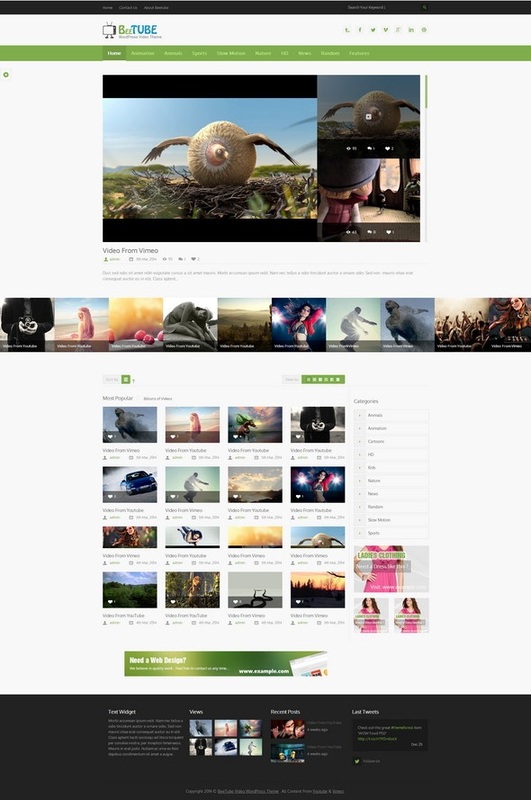 Nillplay is a WordPress theme that makes video content interesting for your users. You can choose from a variety of color options and fonts to help you give your website the look you need, making sure that it matches the personality of your brand. With so many features to explore, Nillplay users have the ability to make unique websites with the help of this theme. Inspired from video websites like YouTube, VideoPress allows you to upload your self-hosted videos and allow users to make their content available in a great way. With VideoPress, you have a lot of possibilities to consider when building your website. It also supports different types of sources through which video can be embedded. There are a lot of color choices and with a responsive layout, you can be sure that you reach your audience who use different devices to access your website.